Germany 1948. Ernest was 12 years old when he saw the film Tonelli. 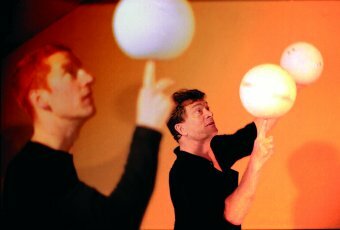 The jugglers in it, Francis and Lottie Brunn, were exciting. And in this moment the boy knew what he wanted. What he did not know was that the duo on screen, Francis and Lottie, actually were his half-brother and sister. Twenty-five years after that decisive visit to the cinema, Ernest Montego, now a master juggler himself, finally met his half-brother in Las Vegas. DANCE OF THE SISYPHOS, about the life of one of the most famous jugglers in the world, Ernest Montego, is both heart-warming and heart-breaking. By telling the story of this remarkable family of entertainers, the film clearly shows what is often overlooked: the degree of devotion and rigorous training behind the juggler's art, giving the audience an impression of weightlessness for just a few magic moments - a truly Sisyphean task. Bert Schmidt attended film school in Paris and has been working since 1986 - after assisting Rosa von Praunheim and the Iranian filmmaker Sohrab S. Saless - as a director, author and cameraman. Together with filmmaker Dieter Reifarth, he is co-owner of the Frankfurt-based production company Strandfilm. Together with Reifarth, Schmidt made the documentaries Vivace, Buecher and Hugo Meyer - der kleine Prinz vom Oederweg.